The tankard is set with exquisite silver reliefs from about 1600 which tell the Biblical story of Susanna. The scenes show how Susanna was spied upon while bathing, and then falsely accused of adultery by the Elders. She was rescued by the young prophet Daniel and the Elders were condemned to death. Cylindrical tankard and cover; parcel-gilt; subjects in relief oxidised; round the body a series of four subjects chased in high relief, representing part of the story of Susanna; four grotesque masks in full relief on base; cover with four medallions with Cupids on dolphins; centre surmounted by dancing Cupid; plain surfaces with faint stippled ornament; inscribed. Origin: Augsburg; mid-17th century; mark of David Schwestermüller I (master 1628, died 1678). The goldsmith has incorporated four silver reliefs of the late 16th century around the body of the tankard. (i) Assay mark for Augsburg, 16—(R3 152(F)), or Seling 69(1645-50). (ii) The initials SM within an oval: the punch-mark of David Schwestermüller I (R3 724; Seling 1442). This pair of marks is stamped three times on the tankard: on the rim of the cover (close to the handle); on the rim of the foot (close to the handle); and on the base of the liner (in the centre). Commentary: The maker's mark has been identified in Seling 1980 as the punch-mark of the Augsburg goldsmith David Schwestermüller I, who is recorded as having been born in Ulm, accepted in Augsburg as a master in 1628, married for the first time in 1629 and for the second in 1643, and died in 1678. His name recurs in various Augsburg records, and his earliest work (listed in Seling 1980, p. 174) is a ciborium of 1631 which was borrowed from the cathedral in St Gallen for the Exhibition ‘Augsburger Barock’, held in the Rathaus, Augsburg in 1968 (no. 533). Of the eighteen marked pieces of silver-plate by this maker preserved in Moscow, the parcel-gilt tankard given by the Swedish King Karl XI to the Tsar in 1674 has some similarities, in particular the winged amorini in relief on the silver cylindrical frieze around the body and the use of very similar applied silver auricular scrolling masks, not only on the spreading foot-ring but also on the cover (see G. A. Markowa, ‘Deutsche Silberkunst des XVI-XVIII jahrh, in der Rüstkammer des Moskauer Kreml’, Moscow, 1975, p. 68, col. pl. ; also, F. Martin, ‘Schwedische Königliche Geschenke an Russische Zaren’, Stockholm, 1900, pp. 35-6, pl. 30). Perhaps the most famous work with which his name is associated is the silver-gilt equestrian figure of King Gustavus Adolphus of Sweden (H. 44 cm), which is preserved in the National Museum in Stockholm (illustrated in Seling 1980, fig. 587); three further examples of his equestrian groups were listed in Rosenberg 1922 (R3 724 c-e). According to the Inventory of the Armoury in the Moscow Kremlin (published in G. D. Filimonow, ‘Opis’ Moskowskoj Oruzejnoj palaty’, II, (in Russian) 1885, no. 1919, pl. 309), the unique equestrian figure group of King Charles I of England (H. 45.5 cm) bears the punch-mark of this goldsmith (see Markowa 1975, p. 58, col. pl.). This tankard, however, is unique within the oeuvre of this gifted goldsmith because of its extraordinary construction, which was doubtlessly dictated by the terms of a specific commission. It may be presumed that, at the special wish of the patron, David Schwestermüller I had instructions to incorporate into a tankard four existing silver reliefs with scenes from the history of Susanna. There is no record of what became of the remaining silver reliefs in the cycle, if (as may be assumed) the complete cycle began with the scene of Susanna bathing and ended with Susanna and her husband, Joachim, thanking God for the intervention of the young Daniel and their happy deliverance from injustice. The evidence concerning the full extent of the cycle is missing, but in part, it can be deduced from an incomplete set of five lead plaquettes from the same Susanna cycle preserved in the Bayerisches Nationalmuseum, Munich (I. Weber, ‘Deutsche, Niederländische und Französische Renaissanceplaketten 1500-1650’, Munich, 1975, p. 302, no. 692, pl. 190). The lead series begins with the scene of the condemned Susanna being led away for execution - the second of the four scenes on the London tankard. When both the lead and silver versions of this scene are compared, the only major difference is the absence (on the lead plaquette) of the architectural setting and background on either side and above the figure group; one minor difference can be noted on the right-hand side: the drapery fold from Susanna's rear ankle to the calf of her left leg has been omitted on the lead plaquette. The next scene in the lead series in Munich is not represented on the Waddesdon tankard but has been illustrated and described in Weber 1975 (p. 302, no. 692.2) as “Susanna wird in den Kerker gestossen” (Susanna being thrown into prison). On the left-hand side of the scene Susanna is depicted disappearing through an archway, while the gaoler appears to molest her. In the right-hand half of the scene two soldiers facing right are shown standing behind a third figure in a toga-like robe depicted walking towards the right, but this third figure is cut off vertically by the edge of the plaquette so that only the right leg, the back and one shoulder are included in the relief. It is the only example among the extant plaquettes of this cycle that cuts a human figure in two, although this illusionistic trick is repeated in the fourth and final scene on the tankard where the head, forelegs and chest of a horse are represented (on the extreme right) but the rest of the horse's body is cut off by the vertical edge of the plaquette. The next scene - the return to the seat of Justice - has survived in both the lead and silver series, with virtually no changes except for a few minor details of engraved or chased decoration on the draperies, etc. However, on the lead version the top right-hand corner (including one engraved conical head-dress) is missing, as the edge of the lead plaquette follows a curve to form a rectangular plaquette with a rounded arched top; the corresponding left-hand segment of the arch is missing, having been broken off in the centre. Consequently, the distant view of the buildings seen through a double arch (on the silver version) is lacking and the heads of the soldier and his captive Elder now project, like cut-outs, above the solid mass of the lead plaquette. The next scene - the two condemned Elders being led away - is identical in both lead and silver versions, except for one major and one very minor variation. On the tankard the latter is an improvement on the lead plaquette, for although the raised foreleg of the horse (on the extreme right) is depicted in low relief, the other foreleg is omitted on the lead version, creating a most uncomfortable visual effect. The major alteration occurs in the upper part of the lead version which is, again, partially missing so that the background of distant buildings is omitted. However, most significantly the fragment of the background that has been preserved above the soldier's plumed helmet does not correspond with the silver version - unlike the curved fragment of the upper background that had survived in the lead version of the previous scene of the return to the seat of Justice. Above the soldier's plumed helmet in this lead version of the condemned Elders, the fragment depicts a brick (or stone) wall, with no indication of the square pillar (on the right) or the distant view of the architectural landscape. Finally, the lead series in Munich contains one more plaquette, which has been described in Weber 1975 (p. 302, no. 692.5) as “Susanna und ihr Gemahl danken Gott” (Susanna and her husband thanking God). The kneeling figures of Susanna and Joachim (in the foreground) are accompanied by several other figures, male on the left and female on the right, with a caesura in the centre of the composition - reminiscent of the traditional pictorial representation of the scene of Christ's Ascension, or even of the Translation of the Virgin to Heaven. (i) 'Susanna falsely accused' has a scratched VII. (ii) 'Susanna led away' has no scratched numeral but as there are file marks in that area, presumably connected with the later fixing of the top of the handle, they may have been erased. (iii) 'The return to the seat of justice' has a scratched VI. (iv) 'The guilty Elders led away' has a scratched VII. These scratched numerals seem to have been added in the workshop of David Schwestermüller I, to assist in the assembling of the four silver plaquettes in the correct sequence. The goldsmith appears to have started this sequence of numbers with VI, immediately to the right of the handle, although this relief is the third scene within the sequence of four on this tankard. The numerals may, therefore, have had no significance except within the workshop as an aide-mémoire for the craftsman who was responsible for their assembly. However, the fact that the roman numerals begin at VI indicates that the workshop, most probably, was simultaneously handling five more plaquettes (I-V) in this Susanna cycle. What has become of these plaquettes is not known, but presumably they would have been incorporated into the construction of a new object, such as a casket. That such an object was not necessarily an ecclesiastical object is established by the Waddesdon Bequest tankard by David Schwestermüller I, which was clearly intended as a secular vessel since the remaining silver reliefs that he has added to the cover have a wholly profane subject - amorini and dolphins - while the silver figure at the apex is a dancing putto. Because the evidence of the Munich lead versions indicates that, for some reason, one of the sequence (Susanna being thrown into prison - Weber 1975, no. 692.2) was omitted from the set of four silver plaquettes chosen to be incorporated into this tankard, it follows that a similar rejection may have occurred when considering the earlier scenes (I-V). Consequently, there might originally have been a matching tankard incorporating four silver plaquettes from the first part of the history of Susanna. In Weber 1975 (p. 302) these plaquettes were attributed - in the absence of a known source - to a workshop in the Netherlands or southern Germany during the late sixteenth century. In style they reveal a profoundly Italianate influence, deriving ultimately from the exponents of Roman maniera painting and sculpture in the middle decades of the sixteenth century. However, the spread of this Mannerist style north of the Alps led to innumerable variations and subtle developments during the second half of the century. Comparison can be made between the compositional designs and the figure styles of the six plaquettes on the one hand and those of the paintings of a gifted Augsburg artist, Joseph Heintz the Elder (1564-1609). He was born in Basle and became a pupil of Hans von Aachen in Rome. His successful career in Augsburg led to his becoming painter to the Emperor Rudolf II at Prague in 1591. In his oil on copper panel (29.8 x 21.8 cm) of ‘The Circumcision of Christ’ (Städtisches Augustinermuseum, Freiburg-im-Bresgau), executed in 1599, for example, there are many essential features reminiscent of the plaquettes of the history of Susanna (for a recent monograph on this artist and his oeuvre, see Jürgen Zimmer, ‘Joseph Heintz der Altere als Maler’, Weissenhorn, 1971, where this little panel is also discussed and illustrated (no. A2, fig. 6). Another contemporary Augsburg artist, Matthäus Gundelach, who was born in Kassel in 1566 and by the end of the sixteenth century was enjoying the patronage of the Emperor Rudolf II in Prague, exhibits many of the same characteristics, especially in his smaller works such as a dated oil on copper (40 x 31 cm) signed 'Gondolach F 1614' (Kunsthistorisches Museum, Vienna, inv. no. 1103), which was included in the ‘Welt im Umbruch’ Exhibition (‘Welt im Umbruch: Augsburg zwischen Renaissance und Barock’ II Rathaus, Augsburg, 1980, no. 464, with illus. on p. 115). In German silver - but on a much grander scale - the Crucifixion relief on the high altar of the Reiche Kapelle in the Residenz, Munich, exhibits many of the same qualities and stylistic characteristics. It was executed in 1605-6 by the Augsburg goldsmith Jacob Anthoni (see F. Haeberlein, Ein Augsburger Silberaltar in ‘Münchner Jahrbuch’, 1938-9, XIII, pp. 122 ff. ; also Seling 1980, p. 236, figs 30-1). 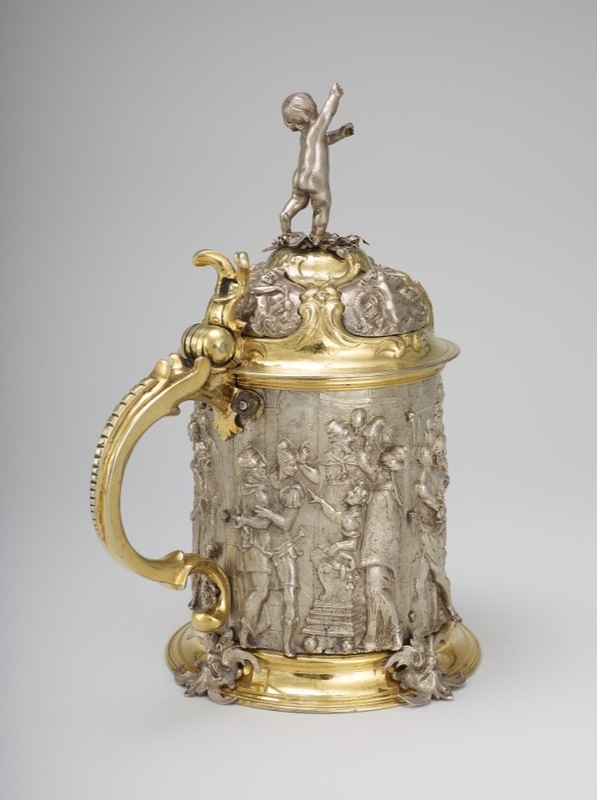 Happily, the subdued auricular style of the mid-seventeenth-century cover and handle which David Schwestermüller I has created harmonises so successfully with the silver reliefs that until the author's research in the 1960s the entire tankard was regarded as being of one date – “late 17th century”. The German antecedents of these four little plaquettes with playful dolphins and amorini include Christoph Jamnitzer's designs in the ‘Neuw Grottessken Buch’, Nuremberg, 1610 (Hayward 1976, p. 354, pls 169-72), his reliefs of the four Elements on the Emperor Rudolf II's Triumph of Cupid basin of 1600-2 (‘Wenzel Jamnitzer und die Nürnberger Goldschmiedekunst 1500-1700’, exh. cat., Germanisches Nationalmuseum, Nuremberg, 1985, p. 33, fig. 27) and his rectangular lead plaquette of a putto with shield and sword riding on a dolphin, c. 1610 (Kunstgewerbe Museum, Berlin, inv. no. K.5769; published in Weber 1975, no. 753, pl. 210, and ‘Wenzel Jamnitzer’ 1985, p. 435, no. 572). However, David Schwestermüller I has not only given the theme a more Baroque treatment but he has given each of the four plaquettes a most irregular shape that fits snugly into the low relief contours of the auricular silver-gilt frames. By setting these unobtrusively decorative white silver plaquettes into the rich silver-gilt cover, David Schwestermüller I has given a deceptive unity to the entire parcel-gilt tankard while in no way detracting from its unique individuality. Hugh Tait, 'Catalogue of the Waddesdon Bequest in the British Museum, II : The Silver Plate', British Museum, London, 1988, pl.XV, no. 53, figs. 295-301.